After you’ve read the previous series, be sure to check out the previous two parts as well as they describe the new application’s architecture and introduce you to the Validation Framework. In the previous article I introduced you to the Validation Framework. You saw how to use the ValidationBase class, how to apply validation attributes to the properties of your business entities and how to write your own validation attributes. In this article I’ll show you two more important concepts: writing your own business rules at the entity level (as opposed to the property level) and localization of the Validation Framework and validation rules so they can be used in multi-lingual web sites. Besides simple value validation, you are likely to have more validation needs. For example, it’s not uncommon that you have the need to validate two or more properties in relation to each other. Consider for example a Project class that has nullable StartDate and EndDate properties. You could use the NotNullOrEmpty attribute to enforce that both these dates contain at least a value. However, for a valid Project instance you need more, like making sure that the StartDate is not greater than or equal to the EndDate (naturally, a project should be started before it can be finished). So how would you go about validating this in the current Validation Framework? The answer is: override Validate(). Virtual methods are methods that can be overridden in a child class (using the override keyword) and are an excellent way to implement behavior in a child class that differs from the base class. So in order to implement your own validation rules for related properties, all you need to do is override the Validate method in your business entity. If you do so, be sure to call base.Validate() as well as that executes the standard validation rules as you’ve seen so far. You’ll see how this works in a bit. // ... Other proprties here; omited for brevity. Notice how this code calls base.Validate() first and stores the results in the baseValid variable. When you call base.Validate, the code that checks the individual properties is executed. The code then proceeds with some custom logic: in this case, it compares the StartDate and the EndDate. If the StartDate is greater than or equal to the EndDate, a new BrokenRule is added the project’s BrokenRules collection using a handy Add overload on the BrokenRules collection class. At the end of the method, the combined result of the base class and child class validation is returned. This way, if either one of them fails (or both ), the method returns false and the BrokenRules collection now contains your own rules as well. Typically, you don’t need this, and you should use the parameterless version from the first example. However, knowing how to use this overloaded version can be useful, especially when you’re fixing up some behavior or data in the Validate method yourself before you want the base class to do its work. Validate(): A Method or a Property? Initially, the Validate() method was called IsValid in AzamSharp’s version. During a few pair programming sessions with my colleagues at Design IT to let them provide feedback on my implementation of the Validation Framework I noticed they initially tried to use IsValid without parentheses. It turned out that — based on the method’s name — they thought it was a property, rather than a method. I very much agreed with that reasoning and thought about a fix: renaming it to Validate() or making it a property instead? We really had some discussions about it before we came to our final conclusion. From an API point of view, a property called IsValid would have been the easiest to read. This is the way that the Page class and various Validation Controls in ASP.NET implement it. However, in order for that IsValid property to get a value, you need to call Validate first. Since the Validate method does so much work, and, more importantly, changes the inner state of the business entity, just a property called IsValid wouldn’t have cut it either. So, that brought me down to two choices: a void Validate method and an IsValid property that is set by Validate, or just a Validate method. To minimize the code you need to write, I decided to implement just the single Validate method. However, if you feel it’s more natural to have an IsValid property as well, you can easily fix that in the ValidationBase class yourself. So far the validation examples you have seen contained hard coded validation message detailing the reason why validation failed. For English only applications, this is not a real issue. However, many of today's web sites need to be multi-lingual, so you'll need a way to easily present this data in different languages, without writing many versions of the applications. You'll see how the Validation Framework implements this localization behavior in the next section. The ability to localize error and validation messages is a key concept of the Validation Framework. You certainly don’t want to hard code validation messages in English (or your own “default” language) into your properties directly. This makes it near impossible to use your business entities in multi-lingual web sites. ASP.NET already comes with great tools to localize the UI of web sites and string resources so it makes sense to hook into that existing framework. Set the Key property of the ValidationAttribute rather than the Message property. Override GetValidationMessage of ValidationBase in a child class to get a localized messaged based on the Key property of the ValidationAttribute. Define Localization files for the supported languages and create the required keys and translations. Rather than setting the Message property of each validation attribute as you’ve seen so far, you now need to set the Key attribute (notice that Message and Key are mutually exclusive; you’ll get a run-time exception when you try to set both). The keys used in this example refer to localization keys in resource files defined in the project, as you’ll see later. 2. Override GetValidationMessage of ValidationBase in a child class. This means that by design, you’ll end up with the key as a validation message if you don’t implement your own translation services. In this code snippet, the General class is a standard Resource file and is used to get the language and culture neutral translations (English in my case) and the localized versions of the validation messages. The ASP.NET Framework will figure out from what resource file it should get the messages, based on the current language. You’ll see how the language is set later in this article. These files contain the fall back validation messages (General.resx) and language and culture specific versions of them (General.nl-NL.resx with all validation messages translated in Dutch). As soon as you add these Resource files to your project (using Project | Add New Item | Resources File), you get a strongly typed class named after the resource file that provides access to the keys. You can then access this class in the GetValidationMessage method and retrieve the necessary validation messages. However, if the user requests a language that’s not supported, the system will fall back to the culture and language neutral texts defined in the General.resx file. Create global resources in your web application. In a Web Site Project you do this by adding Resource files (with a .resx extension) to the App_GlobalResources folder. With a Web Application Project you can put the .resx anywhere you like, although you’re advised to standardize on logical folder names and thus store them in a folder like /Resoures. With this setup, you can centralize your resource files in the UI. For fallback scenarios, the Business Layer still provides default messages for all localizable keys. All business entities in the Spaanjaars.ContactManager.BusinessEntities namespace inherit from BusinessBase which in turn inherits from the ValidationBase class. 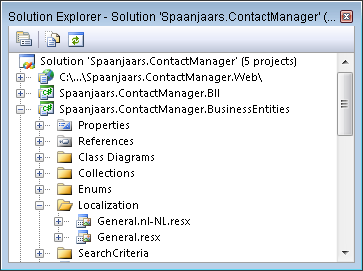 All business entities in the Spaanjaars.ContactManager.BusinessEntities namespace have validation attributes applied to relevant properties. The ContactPerson class overrides the Validate method of the ValidationBase class so it only returns true when the instance is valid and all of its collections are valid as well. The collections, like AddressCollection all inherit from BusinessCollectionBase<T>. This gives these collections validation behavior as well. The validity of a collection is currently determined by looking at each individual instance in the collection. If one is not valid, the entire collection is considered invalid. Note that you’re not limited to checking individual instances. The Validate method from the ValidationCollectionBase class is virtual, so you can override it in a class like AddressCollection to ensure, say, the AddressCollection contains at least one address, or at the most one Home address if that’s what your application requires. The *Manager classes in the Spaanjaars.ContactManager.Bll throw an InvalidSaveOperationException (a custom class defined in the Spaanjaars.Validation namespace) when you try to save an invalid BusinessBase instance. Code in the code behind of Default.aspx executes when an address is about to be inserted. Inside the Inserting event handler, an instance of the Address is retrieved and validated. When the instance is invalid, a bulleted list (using the same ErrorList control) with validation messages is shown. I have only implemented this for the Address class, but it’s easy to write the same behavior for the other contact entities as well. As you have seen, validation is quite a broad topic, with many different factors to keep in mind. How to inherit from the ValidationBase class and use its Validate method. How to use Validation attributes and how to write your own for validation purposes currently not covered by the Validation Framework. How to localize your validation messages in order to display them in a multi-lingual web site. How to centralize the display of the broken rules using a separate User Control. Note that you’re not limited to the implementation you’ve seen here. It’s likely you’ll need to write additional validation attributes (attributes like MinimumValue, MaximumValue, RegularExpression, ZipCode and so on come to mind) to support all your business logic. Did you write your own validation attribute based on this article? Drop me a line and if the attribute looks useful and reusable, I’ll add it to the Validation Framework and these articles. In the next part in this article series, I’ll take a look at advanced data concepts: Sorting, Paging and Filtering. Stay tuned. In the Validate method override above, you first call base.Validate(), then do the start and end date stuff and then return the combined result. Is it really necessary to continue doing the start and end date stuff if the base.Validate() fails? (1) It would be preferable to return error codes (enums) for failed validation instead of/in addition to error messages. This way the BLL's client (Presentation Layer UI in this case) can decide the actual message to display. (2) In your diagram of the n-layer architecture the business entities "flow" between the different layers. Yet, the BLL validation is happening in the business entities rather than the BLL itself. Moreover, with validation such as checking that start_date is before end_date etc. in the business entity class it's no longer really a "dumb" class. (3) Validation of *data* in business entities and the resultant error messages are only a part of an overall error reporting structure. How about "process oriented" validation and errors (e.g. payment authorization from a payment processor) which are initiated from the BLL and have nothing to do with the database? Would the BLL classes also need a similar framework? It depends. If all you need to know is whether validation fails, then yes, you could exit the method as soon as base.Validate() returns false. However, if you want to present a complete list of validation errors in the UI including the custom ones, you need to complete the custom validation as well. 3) Yes, sounds like a good idea. Depends on the actual implementation though. I feel very happy after read this article thank u sir for posting such useful article. I want one thing from you which Design pattern you used in your given sample project. OR Which Project Design Pattern is best if i used your approach. My design does not use / is not based on a single design pattern. Thank Sir for your reply. I learn your parte3( Validation part ) yesterday it is amazing because custom validation support the localization . i am waiting for next post. I have CityMaster i want to validate whether the city is already exist or not when user entered his record. if user is married then fetch the DOB . how can i validate above given two validation . 1) Yes, you can do that. Either when you save the object and then throw an exception, or when you call the Validate method. The latter solution causes a bit more overhead though. 2) Isn't that what's being done in the override of Validate? sorry for my above second point. => I have two property in my customer object first one is "ISMinor"(Boolean) and second is "DOB". i would required following validation . If ISMinor property is true then DOB property is mandatory . how can i achieve this composite property validation ? Again, isn't that what's being done in the override of Validate? Thanks for the amazing articles. Looking forward to next ones. Would be making any changes to the design based on Nandan points? Just wonding. No, no plans to change anything in the current articles and source. However, he/she brought up some valid points, so be sure to consider them if you build anything based on this design. Thanks Imar... I have alredy started building an application based on your desing. Do you have any post for exception handling or know a good post which you can recommand for exception handling? brings up many useful results. I am the big fan of these articles. I builded a real time e-commerce based on your design and it works great. I have a question about the validation framework. Checking properties with attribute is the right thing to do(at least just talk about IsNullOrEmpty validation)? I mean if you want to insert a new object, of course the email property cannot be null or empty. But what if you need to update the table(may be last login column) and you don't have the email address, You need to get that emaill adres from the database first i think. And this is a unnecessary round trip to database. This can be happen, assume that you need to update the last login time of the user. The only necessary sections are The customerID and the Datetime.Now. Why do i need to give the emailladdress(or some properties that can not be null or empty). I modified your first design (Articles about .NET 2.0) and put a decision mechanisim whether the the column will be update or not(pass the null value if the property default, and on the database side it checks will it be update with the IsNull function) But with your new validation mechanism it is kind a problem. What do you say? 1. Simply do get the data from the database and do a full update. I often prefer that, as I can enfocre my logic (e.g. update other relevant data, like LastModified for example). 2. Create a separate table and object, called UserLog. This way, the data is stored separately from the user. 3. Create a log method on the User class that accepts a user name and a datetime and updates the data. 4. Lower restrictions on Update. If you can tell for sure the data in the database is OK, you can be more relaxed on updating the data. However, then you'll need to call separate SQL statements or stored procedures to do a partial update. 5. Execute the update statement from a SqlDataSource in the markup or code behind of the page. You're doing string comparisons in the public int Compare(ContactPerson x, ContactPerson y) function in the ContactPersonManager.cs file. I was wanting to add a contact person photo to my contact person object and I was wondering how I would compare the two photos in the compare function? Pictures are difficult to compare. You either need to use complex image recognition software for "looks like comparisons" or you can simply get an image hash of the picture and compare the hash. In the latter case, changing a single pixel marks the image as changed. This gets the hash of an image based on its path, but it's easy to change it to get it based on an Image instance. Yes, it is. Make sure your object inheriting ValidationBase is in scope (you may need to get a reference to it first) and then you can add messages in a catch clause. Afterwards, you need to bind the BrokenRules collection to a UI control like a Repeater. I am big fan of your articles. i am waiting to next article. Kindly check the following written code and suggest me if you have any other better approach to handle the concurreny and also nay drawback of below code. I am using the Timestamp column in my table to handle the concurrency in SQLSERVER. I saw this article last week and i found quite useful. But one thing came in my mind how can i handle the following situation. Now I want to the show contact record in gridview but instead of showing foreign key of createUserId column I want show actual person name (name from UserMaster table) who created this record. For the above problem should I use Dataset or it can be implemented using object. OR any other way to avoid the above problem. I'm also wanting to capture the username of the logged in user who makes the change to a contact person. Is there an easy way to retrieve the user name? 2. Create a UserName class and add that as a property. From here, things could be more or less the same as in the first scenario. The MembershipUser also exposes a UserName property that you can read. Thanks a million! This helps alot. Do I have to include anything special in the using section if I use either of these methods? Thanks Imar for you quick response. It means we have to create additional property for each attribute that we fetch from reference table. These properties would be an overhead during insert because CreateUserID field would be inserted in ContactPerson table. If we are to expose our get methods in web services then both CreateUserId and CreateUserName properties would be returned but we want to return only the CreateUser Name property. Can we design a seperate DataTransferObject class that would have each foreign table column as a property and would not have Id columns. These dataTransferObject collection can be used to bind grids and to respond web methods. What is your opinion about handling reference columns for an object by introducing DTO objects. If you want to expose read-only data, you can use LINQ and Anonymous Types to select and return only the required data. If that doesn't help, I am not sure I understand what you're saying / asking. i have posted my problem with code in following link. Imaar? Who is Imaar? My name is Imar. Anyway, looks like you've gotten an answer on this question in the mean time. That would have been my recommendation as well: Don't store just the CountryId, but create a Country property, that in turn exposes an Id and a Name property for example. By the way, +10 brownie points for using the correct terminology... N-Layered instead of N-Tier (which is often used incorrectly). I thought I'd share this approach with your readers and perhaps get your opinion. i think that's because of BusinessBase ? would you please show me how to change and i will change rest of the properties. Mark: would you mind uploading your solution? i'm curious to know more about your implementation - thanks. If you don't want to use a named parameter, you can create a constructor that just accepts the Message in each of the Validation attributes. Simply don't use an attribute. Please take another look at part 2; most of this is all in there. Yes, I was also planning to use extension methods for sorting/paging of Business Entity collections. The code that was in my original post was my implementation. I'm using extension methods to add the Validate function to any Collection of objects that subclass ValidationBase objects. I also plan on using the same technique to implement sorting/paging in my business entity collections. Imar: thanks for quick response appreciate your help. and i did read your part 2.
is there a way i can display errors in pop-up window? You can have the ValidationSummary trigger a client side alert box. Alternatively, look into client frameworks like jQuery to build a pop up. Add a new BusinessEntity Class called "Visit"
First of all: please read things carefully. There's no need to create the same error 5 times if it tells you not to use HTML or generics syntax. Secondly, please don't use my site as a public forum. This is not the best location to post loads of code so if you do that again I'll remove it and ask you to repost it on a public forum like http://p2p.wrox.com. See what I am seeing? If not, maybe you're missing important .NET / ASP.NET basics that you need to work on first? and feel free to remove my posts. I understand why you're posting your code, and as you have found out, I typically do try to help people answer their own questions. But, as I also said, this isn't a good place to post a lot of code. As you found out, you can't post angle brackets as used in HTML and C# generics and VB attributes. You also have no color coding or formatting available. So, all I am asking you is to not post huge amounts of code here, but instead to post that on a forum like http://p2p.wrox.com. That isn't too much to ask is it? Did you find your mistake? It's staring you in the face isn't? Thanks fore the great article again. How can I display the BrokenRules if I am using an ObjectDataSource with a GridView? The ObjectDataSource1_Updating event only returns InputParameters (e.InputParameters). I can creat an instance of the Entity object and assing the values for the properties and then call the Validate() method. But I was wondering if there is an easier way? In the overridden Validate method you're using BrokenRules.Add("bla bla bla etc..."). How would you localize this message? This is fine. Your code does look very similar to CSLA.Net framework mind. That's not so easy if the two objects are not related to each other. However, if one object is a property or otherwise a member of the other it's pretty easy to do as you can treat it as any other property or field. I built something very similar to your validation framework a couple of years ago and I remember I had to deal with a couple of things that I don't see solved in your framework. One is already asked by dgmassimiliano. How do you handle domain validations with your framework? Did you built a separate mechanism to do this or you didn't take it into consideration for this series of articles? And second, How do you handle validation on collection properties of an entity? For instance, suppose you have a Person Entity which has many Addresses, when you call .Validate for Person, will your framework validate all the addresses as well, you have to do that separatelly? Re 1): The *Manager classes can handle this. A top level class like a ContactPersonManager can easily look over multiple objects and apply any kind of validation rules. It's currently not implemented in the demo application. Re 2): Each collection inherits ValidationCollectionBase which has a Validate method that validates all the internal ValidationBase instances. The Validate method is virtual so you can override it if you need to. With regards to your solution, how did you solve these things? Are your ideas available on-line somewhere, as an article or source maybe? I presented this material to a dot.net user group Thursday evening. I was a bit too much to present in one sitting, but i think all were impressed with the possibilities. I have a code generator based on the first artical series and will make it available when i get a login set up for it just to track users and prevent abuse. hy imar, wow this lesson was a little difficult for me, i need you help again! This validation doesn't work: is it wrong or i have to do something else??? My question goes along with Shuaib's. When I create an Updating event on my ObjectDataSource, I don't get an InputParameter of my business object. My InputParameter collection has 20 items in it (one for each field). Could this be because I'm using TemplateFields? It shouldn't be like that. As you can see in the examples above using odsAddresses_Updating, I do get access to the entity. Inside a data control, like the GridView, you do have single values for all your entity's values, but once it hits the ODS it should be an entity, not separate values. Also, in my example I am using template fields as well, so that shouldn't matter. Do you have a different setup? Using different controls maybe? Figured it out. I didn't have the DataObjectTypeName property set on the ObjectDataSource. Again, excellent articles. From MSDN: DataObjectTypeName gets or sets the name of a class that the ObjectDataSource control uses for a parameter in an update, insert, or delete data operation, instead of passing individual values from the data-bound control. Wow, dude you rock!! Thanks so much for sharing your knowledge. without the DataObjectTypeName in DataObject properties??? It won't work (myBusinessBase ) if I not specified it. I am not sure what you're asking, or what the problem is. The DataObjectTypeName atribute is just a design time helper helping the ObjectDataSource wizard find the right objects as design time... You should be able to leave them out (although I don't understand why you would want to do that). I'll try to explain the issue that I have faced with. In my old business rules I had an update method looks like that: UpdateRecord(int id, string title, string description). But my record have also "addedBy" (Guid) and addedDate (DateTime) properties. Your method, where we use the Update(Record record) trying to update these addedBy & addedDate properties... but I don't need that... Also I got exception that says: addedDate cannot be converted from string to DateTime right after I click the Update Button in the DeatilsView. So I want these records not to be updated. How to set the ObjectDataSource not to update some of the properties in the class that I have exposed in the DataObjectTypeName? Please ignore parts of my previous message. I thought you were referring to the DataObjectAttribute rather than then DataObjectTypeName. Anyway, the ODS will always give you the entire object. You could choose to not serialize some properties (as keys, or as columns) but then they'll loose their values. That's the reason why in the code behind of a details page I am getting the entire object and only update the properties I want to update. You could so that too, or you could write code in the UpdateItem method of your business object and only update what you want. About the "Validate(): A Method or a Property?"-part. In my WinForm application I use an IsValid property. I think this is handy when, for example, I want to disable my save button, if the business object is not valid. I just databind the buttons IsEnabled property to the IsValid property. And because all my business objects implements the INotifyPropertyChanged interface, the save button wil become enabled when IsValid returns true. Would love to hear more from you when you have implemented IDataErrorInfo. I have looked into that briefly some time ago as it looks like an interesting option, but I haven't written any production-ready code yet. Have you integrated unit testing into the this framework? I'm doing some light experiments on it now and was just wondering if and howe you did this. Once again, thank you! This series has started be on the road to new possibilities. Depending on the project I use this or NHibernate. Were it not for this series it would have taken me much longer to learn NH as well as many other frameworks! Thanks! Ok, was not paying attention. I've been a little disappointed with MS UTF. I started to use NUnit and am finding it fairly easy to create an inheritance chain for all the base classes while using the attribute validation as you are using in your project. I am trying validate 2 objects in the UI is there anyway of appending to uxErrorList.BrokenRules. Tried .Add but it didnt work as expected fro me. Its probably staring me in the face but I just cant see it. This is a really class solution. It should work. However, "didnt work as expected fro me" is way too vague for me to see what's going on. It's still not making any sense at all. What is uxErrorList? Where is it defined? From where are you trying to add error messages? From which layer to whcih object? If you want my help, you have to help me help you by asking questions that can be answered, providing relevant context and information, error messages and so on. Yours doesn't qualify as one at the moment, i am afraid. Yes sorry I was trying to be succinct. uxErrorList is the user control, in your example you called it ErrorList1 (defined in ErrorList.ascx). I am trying to add from the UI, basically I am asking if its possible to validate 2 different objects in 2 different calls then concatenate the 2 results. I know I am missing something here! For the record: I don't have mind reading skills. Typically I can answer these kind of posts pretty fast as I don't have a lot of investigating to do. But if you rather have me spend my time on opening Visual Studio, getting the project from source control, find the right user controls, finding the right calling location, add the code you are describing here myself, run it in the browser and then see the error you are getting: fine. I can do that but then you're not on the top of my Todo list anymore and you can easily wait weeks for an answer. So: please be concise and detailed. The error or behavior is staring you in the face so why not post it here? Its ok I can work it out for myself I kinda thought that it made sense I was obvoulsy wrong I apologise and wont be bothering you again. And too think i was going to purchase the pdf as well! Rude? I don't see how I am being rude. I am trying to explain to you what you need to do to help me help you. I don't see how you think I can help you if you don't provide me the information I need to help you. I also don't see why that would be rude in any way. So, I am more than happy to help you, but you have to provide me with information I can use. The result is cp is not valid but the BrokenRules are empty. Seems they got lost once out of the address validation. Did I miss something? This is not required, but makes it easier to add ranges. Make sure you import the namespace where appropriate. This way, the broken rules of each instance (an Address for example) are now copied into the BrokenRules collection of the Collection class. Notice how I also changed && to & in the calls to the Validate methods of the collections to stop short circuiting and making sure Validate is called on all three collections, regardless of what earlier calls on that line returned. When localValid is false, the items for all three collections are copied. You may want to optimize this a little. Then again, when one of the Collections is empty there's not much to copy so I guess there's not much overhead involved. Thanks. That's very helpful. It would be ideal to have the broken rules to handle the addrange without explicitly doing it in the override. I'll give it a try. But before any of those, is it correct to expect the validation cascade over a complex object structure? Or that's the wrong approach to begin with? It's really very helpful article on N-Layered Web Applications, also I have read comments of various article readers on this Validation framework, I am also concerned the comment posted by Santosh regarding Duplicate Data Validation against Database. And also read you reply to "throw an exception when objects going to save whether in BLL Save method or Dal Save method ". I want show custom error message at UI Layer, without throwing a exception from BLL Save Method or Dal Save method or from Both. from calling a Method IsDuplicateData(cityName) in DAL via BLL Layer Method IsDuplicateData(cityName) in presentation layer. after that I flush out a custom error message in UL layer. However, I am not accessing DAL Method directly in UI layer, instead i am calling Dal method through BLL method as you have done ContactPersonManager.Save(). I have implemented this in UL layer and I am thinking I have implemented Business Logic layer in UI Layer. Because of only I want to show Custom Error Message such "Duplicate city name!". Sounds OK to me. Although you make the call from the UI, you still implemented the logic in the business kayer. Just be prepared for an additional error if a duplicate is created after your check. Just search the project for Culture and you'll see it's done in the BasePage class. Yes, I saw it. Thank You Imar.